This is the Flett crest featured in a stained glass window in Magnus Cathedral, Kirkwall. I viewed the Flett family coat of arms with great interest. My ancesters trace back to William, David, Peter (2), George Frederick and George.The later two in Australia but the others to England and originally The Orkney Islands at Kirkwall, Stromness Orkney. This is much different than the other coat of arms I had found around the internet. At least for the region of Scotland - Two Stags Facing each other and a national flower on the bottom if I remember correctly. My ancestor, John Flett, came from the Orkney Islands in the early 1800s. He worked for the Hudsons Bay Co. and later settled on one of the Selkirk lots in the Red River area. His son moved to Sask in 1875 where he farmed at Flett Springs which is a few miles from Melfort. Hallo , I am from NZ and my great great grand father was a Flett, from Stromness and then I believe back to either Sweden or Denmark, He settled in NZ in 1856. My great grandmother, Catherine Flett, emigrated to Canada from the Orkneys in the early 1900's. She was a widow and homesteaded in the Binscarth, Manitoba area. My sister, cousin and I hope to see this crest at the cathedral when we visit the Orkneys this Aug. and Sept.
Documented in Kirkwall library is an article about Thorkel Flett, subject of the stained glass window.He was assassinated circa 13th C. He lent his longboat to one of the three feuding earls of Orkney. My maternal g.g. Grandfather James Flett of Fraserburgh was born in Kirkwall.. 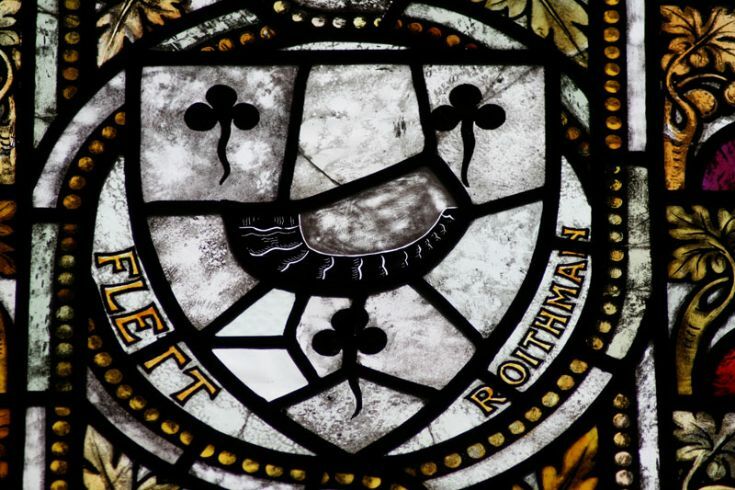 I would like to know the meaning of the term 'roithman'. is it ancient Nordic? This was most interesting. My gggrandfather came to Canada in 1846, worked for HBC in McKenzie district for 36 years. He was born in Orphir, Orkneys 1827 or 1829. After retiring he moved to Red Hill Saskatchewan and died there in Prince Albert in 1889. He had a very distiguished record with HBC. Found Nora Lande's comment interesting. My gggrandfather John Flett came to the Red Deer Hill area from Winnipeg in 1875. His father was from Kirkwall in the Orkneys. Wonder if there is a connection. After years of family research, I finally discovered that I am related to John Flett (Margaret Garioch) who lived in Orphir in the early to mid 1700's. Flatt is my maiden name and my latter generations came through Maryland and ended up in Tennessee and Mississippi. Jasper Flett was my 7th great grandfather. Does anyone have his date he died? My 6th great grandfather was James Flett who married Margaret Garrioch (Garioch). 5th great grandfather was John Flett (Flatt) who was 'transported' to America in 1757 for two counts of larceny. John married Mary Savage in Maryland, then my 4 x great John Henry Flatt migrated from Maryland to Roane Co, TN to Overton Co, TN. My 3x great Isaac Columbus Flatt migrated from Roane Co, Tn to Jackson County, TN where he died in Dec 31, 1896 in Jackson Co, TN. That is my line. James Craigie married Jane Copland immigrated to NZ from Orkney. His parents were James Craigie, a merchant seaman and Jane/Jean Flett B 21.9.1802 d 2.8.1882. Her parents were George Flett and Christian Inkster. Hope I'm on the right lineage. Can anyone confirm for me? And if so can I trace the line back further? I seem to be able to get back to John Flett (1790-1873) who married Katherine Redland (1793-1865) in 1822 and four of their boys, William, Thomas, James and Joseph, left the Kirkwall area of the Orkneys for the Fenelon Falls area of Victoria County about 1.5 hours NE of Toronto, Ontario, Canada. William was my Great, Great, Grandfather and there are still Flett's in that area. I live in Toronto, Ontario, Canada. My family-in-law are Fletts and i managed to get back directly to Jasper Flett b. abt 1683 Orkney - Married to Helen Edward b.abt 1687, and had 7 children 5 boys and two girls. But i can't seem to find the connection any further back. I am in the process of tracing down from Thorkell and later generations which so far haven't yielded a connect to our tree yet. If anyone wants great sites to look i recommend RootsWeb's worldconnect Project Global Search and Family Search. My great grandfather, John Flett 9/10/1831-26/11/1914 and his wife, Jessie Isbister ?/10/1839-23/8/1914 migrated from Stromness, Orkney to Victoria Australia. John Flett is, of course, a descendent of Jasper Flett. Other Orcadian ancestors include Isbister, Sutherland, Stockan/Stoken & Irvine, with others such as Twatt, Stove & Baikie from the Shetlands. Hello to all the Flett's :) My name is Craig Flett and in my family there's a lot more mainly around Wales and Scotland. My grandma is wanting a canvas print of this picture but even the larger picture isn't the best resolution. Is there anyway I could get the original print? I don't mind if you put your name on the bottom. Taken by... etc. Hope you can help and thanks. Hi there, my great great grandfather was Henry Baxter Flett who settled in Milton. My great grandmother was his second to last child Ann. I have a brooch of the coat of arms shield from a reunion held in Milton early in 1996, organised by Graham Flett. I am from the Fletts that came to Australia..
Hello to all, my family tree research is pointing to the Flett families of Orkney as the source of our Flatt family's progenitor in the United States. When I came across this crest image I had to wonder about the device in the center on the black background. At the risk of sounding silly, what is it? Any help would be appreciated. My Grandfather Louis Douglas FLETT came from Fraserburgh to Fort William and then to Dublin Ireland around 1870.His wife's name was Mary and he had 3 sons Jack, Douglas and Desmond Des Flett wasmy father.I wound if anyone has any info on him. The strange looking device in the centre is actually a drinking horn. The coats-of-arms in the stained glass windows were designed by J. Storer Clouston and this one comes from a gravestone at the east end of St Magnus Cathedral next to the sleeping figure of John Rae. Thank you so much for the clarification Spencer Rose. My thanks too for Spencer Rosie's clarification of the Flett coat-of-arms above. I hope to see it in person someday. I am the grandson of Raymond George Flett, I am very interested in where the Flett's originated. Jasper Flett is the futherest known ancestor of mine. Dating back to c. 1600's. I know we came from the Orkneys and we've migrated to Victoria, Australia. It's fascinating to see all these names that I have a connection to. I want to extend my knowledge of my name. Hi. My 4th great grandfather, Charles "David" Flett came from Harray, Orkney to the province of NB, Canada, before 1860 when he died here, with his wife Jannet (Borwick) married Dec 1802, and children, John (1804-), Christian (1805-), Peggy (1807-), David (1813-), Ann (1813-), Jannet (1817-), Jean (1820-), and my 3rd g-grandfather, William Alexander (28 Jan 1815-1871) who married Mary Ann Wark in St. John, NB in 1838. Looking to find the previous generations before Charles David and Janet back in the Orkney's. The name of my line changed to FLEET by my 2nd great grandfather who moved to Fredericton, NB, although some descendants maintained the Flett surname in the Moncton, NB area. Hi Robyn Welsh-Stebbing! You still have some relatives in Orkney through the mother of the first Henry Baxter Flett - Ann Spence Wood. She was born in Evie in Orkney, and there are still Woods in Evie. I went to school with one, who would be your fifth cousin. My family came from a fishing village called Footdee. Its the end of a river that comes from Braemar Ballater right through the northeast and meets the sea in Aberdeen. Are there any Flett family members on here related to Albert Flett, born Flotta 1916? His parents were John and Ellen Flett. My husband's mother was Lillian Kathleen Flett b 10th April 1916 u.c.h London d 1969 Brent London. Had a twin sister. D of Arthur Henry Flett b 22nd Dec 1891 51 High st Erith Kent He was s of a John Henry Flett. Love to hear from any interested searchers. My husband is Michael Donald Flett and his father was Robert Martin Gibbons Flett - we've been told his family originate from Orkney don't know if there are any relatives there? Hi. I'm from Wellington New Zealand. My grandfather, Alfred James Flett came to New Zealand from Banff in Northern Scotland. I'd love to find out more information about my family....has anyone got a family tree? Sorry, I got my Grandfathers name wrong in my earlier post, it was actually William Alfred Flett.